Sammy Davis’s power play goal at 13:28 of overtime delivered the Beanpot Trophy to the #7 Terriers, who defeated Harvard, 3-2, at the Bright Landry Hockey Center. 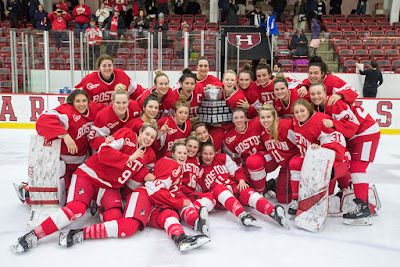 For BU, it is the first-ever Beanpot title as a varsity program. 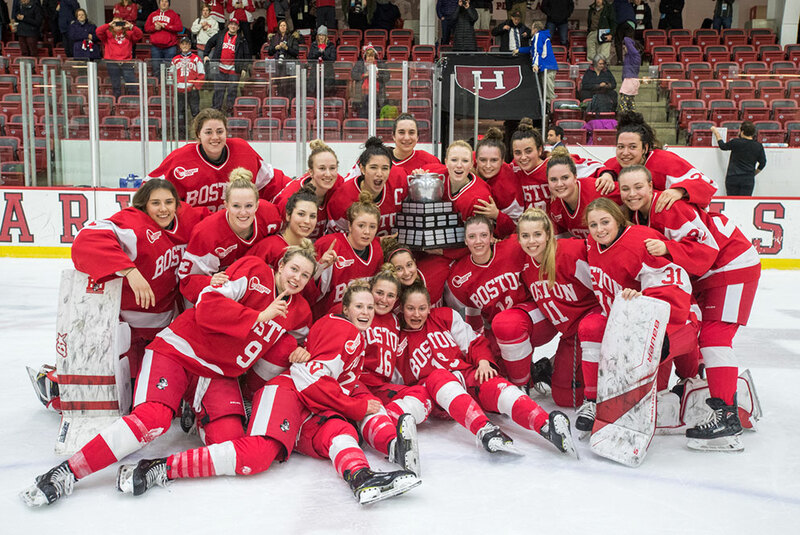 The Terriers, who competed as a club prior to 2005-06, were Beanpot champs only once before, in 1981. Reagan Rust, whose shootout goal provided the margin of victory a week ago against Northeastern, gave BU a 1-0 lead late in the first. Her power play wrister from the blue line went through a maze of players and found the net. Abbey Stanley and Natasza Tarnowski assisted. Harvard replied with its own man advantage goal a minute later on a Kaitlin Tse shot. Five minutes into the second period, the Crimson took the lead on another power play goal, scored by Kristi Della Rovere. Ten minutes later, Tarnowski converted the rebound of Abby Cook’s shot to knot the score at two apiece. BU, which dominated all night in shots and in the face off circle, poured 16 shots on goal in the third—to Harvard’s six—but neither team could take the lead. The Terriers, failed to score on two power play opportunities in the third period, drew a roughing penalty 13 minutes into overtime and quickly produced the game-winner. Jesse Compher took Cook’s pass at the bottom of the left circle, held the puck and then fired it cross ice to Davis charging through the right circle for a one-timer past Harvard’s Lindsay Reed. Davis’s team-high 22nd goal earned her tournament MVP honors. Reed, who stopped 51 BU shots, was named the Beanpot’s top goalie. BU’s Corrine Schroeder turned away 30 Harvard shots, including nine in overtime. BU stretched its nation’s-best undefeated streak to 11 games (9-0-2). The Terriers return to conference play on Saturday for a home-and-home series with New Hampshire. 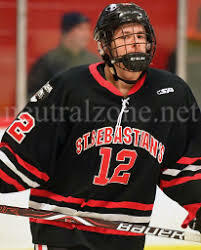 2020 recruit Liam Connors scored a goal and an assist in St. Sebastian’s 5-4 win against Tabor Academy. With 40 points, Connors is the top scorer for the Arrows who stretched their winning streak to 10.